Scientist Roberta Gibson follows a simple recipe and offers alternatives if you have food allergies. She examines the biology, chemistry, and physics involved in a simple cake recipe. Simple experiments include apple slices to study oxidation, popcorn for steam pressure, and learning what makes ice cream fluffy. The most exciting phrase to hear in science, the one that heralds new discoveries, is not "Eureka!" but "Hmmm. That's funny..."
Beware: This column may make you hungry! Did you know that you could actually become a food scientist? Universities, such as Cornell University, offer degrees in food science and technology. A food scientist may work on anything from finding a better way to make butter to figuring out what food astronauts could take to Mars! Have you ever wondered how a few simple ingredients can become a loaf of bread or a luscious layer cake? Although many think of cooking as an art, a great deal of science helps along the way. I learned this when I learned my young son had food allergies and I had to remove all the wheat, eggs, and dairy products from our diet. Understanding the purpose of each ingredient helps you understand if you can safely leave that ingredient out or what you can use to replace it. It also helps you to troubleshoot when failures occur. Let’s follow a few simple recipes and examine the biology, chemistry, and physics involved. Combine all ingredients and mix for two minutes with an electric mixer. Turn into 9x9x2 greased cake pan and bake at 375 degrees oven for 25-30 minutes until a toothpick inserted comes out clean. The first ingredient is 1 1/2 cups all-purpose flour. All-purpose flour is made from a blend of varieties of wheat, which is high in an elastic substance called gluten. Gluten is important to both the structure and binding of the cake. A cake made from other flours that lack or have less gluten, such as oat or barley, will need additional ingredients to reach a cake-like texture. Bread flour will contain even more gluten, which is a key ingredient for making yeast bread. The second ingredient is 3/4 cup sugar. Sugar is one ingredient that is added largely for taste. With a little manipulation of the liquids you can easily substitute honey, maple syrup, rice syrup, or even reduce the sugar and still produce a fine cake. For yeast breads, however, the amount of sugar can be important because it is used by the yeast for growth. The third ingredient is 2 teaspoons of baking powder. Have you ever added baking powder to water? If you have, you know that a chemical reaction occurs, releasing bubbles of carbon dioxide. Cooks have learned to harness this reaction to help baked goods rise. Double acting baking powder just means that another release of carbon dioxide occurs during the heat of baking. Yeast breads don’t need baking powder because the yeast produces carbon dioxide gas while growing in the rising bread. The fourth ingredient is 3/4 cup of milk. Milk adds moisture and is easy to substitute. Plain water, fruit juice, soy milk, or rice milk can be used instead, with slight changes in flavor to the final product. The liquid is important as it mixes with and reacts with the baking powder in the previous step and it also helps to mix the ingredients together. The fifth ingredient is 1/3 cup shortening. Fats and oils help tenderize baked goods, aid in browning, help bind ingredients together, help prevent sticking to the pan and, of course, add lots of the richness and flavor we humans crave. Low-fat margarine and vegetable oils have less fat and more water, so these will change your results. To use them, add more to increase the fat level and reduce the other liquids or add other ingredients, such as applesauce. In some foods, such as cookies, oils just won’t produce the correct texture. Next add 1 egg. If you ever have to bake without them, you soon learn that eggs are essential to baking. They hold ingredients together, add moisture, and can even act as a leavening agent. Generally, if there is only one egg in a recipe, such as this one, then the egg is primarily binding and an egg substitute can be readily used. If the recipe calls for three eggs, then you may have to adjust the leavening as well. Finally, add 1 1/2 teaspoons vanilla, for flavor only. Combine all ingredients and mix for two minutes with an electric mixer. Turn into 9x9x2 greased cake pan and bake at 375 degrees oven for 25-30 minutes until a toothpick inserted comes out clean. During the baking process, the baking powder will release more carbon dioxide, causing additional rising. The heat will dry some of the moisture, particularly at the surface, making the batter firmer. The heat will also change the chemical structure of some of the surface sugars, causing browning. Are you going to have ice cream with that cake? If you have ever made ice cream, you know that it has some science secrets as well. The key ingredients are cream (fat), sugar, flavoring, and most important of all (drum roll please) . . . plain old air! Yes, without air whipped into it ice cream would be about as yummy as an ice cube. Tiny pillows of air make it soft and fluffy, so that’s why you use those ice cream paddles during freezing. On a diet and planning to top that cake with fruit instead? How about some nice apple slices? But everyone knows that if you leave cut apple slices setting out, they will soon turn brown and yucky. It’s not bacteria or rot, but simply that the oxygen in the air reacts with the chemicals in the fruit to cause discoloration, a process known as oxidation. To prevent oxidation, you need an “antioxidant.” One readily available antioxidant is vitamin C, found in orange and other fruit juices. Mix a few tablespoons of orange juice with your apple slices and they should stay fresh looking much longer. Or use strawberries instead, because they are already full of vitamin C and don’t discolor. Another healthy food you may enjoy is popcorn. Ever wondered how it pops or why some batches have a lot of unpopped kernels? The secret is the water inside each kernel. During heating the water turns to steam, building up pressure inside. Eventually the outer skin blows apart, exposing the fluffy exploded insides. I don’t recommend that you try it, but you can get the same reaction by putting a whole egg or a potato with an intact jacket in a microwave oven and cooking it. Sooner or later an explosion will occur due to the pressure of the steam inside. If your popcorn isn’t popping well, try soaking it briefly in some water to recharge the internal moisture. These are just a few examples of how food science can be fun and fascinating. If you would like more information, check the books and websites below. Joan D’Amico and Karen Eich Drummand, The Science Chef: 100 Fun Food Experiments and Recipes for Kids, John Wiley & Sons, Inc., NY, 1995; ISBN: 047131045X. Ontario Science Center, Foodworks: Over 100 Science Activities and Fascinating Facts That Explore the Magic of Food, Addison-Wesley Publishing Company, Reading, Massachusetts, 1987. Originally published in January/February 2002 issue of HELM (Home Education Learning Magazine). 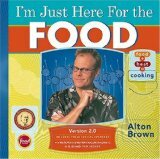 I love Alton Brown’s “Good Eats” Food Network Show. Even though I have cooked for years, I learned so much about the science of cooking from this book! (Karen Gibson). This book of 56 healthy recipes is arranged according to parts of the human body they benefit: heart, blood, muscles, bones, teeth, skin, hair, nails, nerves, and digestive system.